Appalachian Ohio, shaded in green, shown within Appalachia. 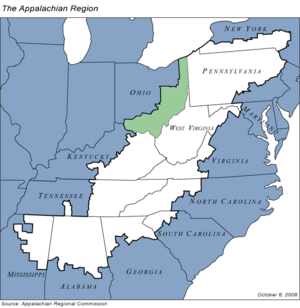 Appalachian Ohio is a bioregion and political unit in the southeastern part of the U.S. state of Ohio, characterized by the western foothills of the Appalachian Mountains and Appalachian Plateau. The Appalachian Regional Commission defines the region as consisting of thirty-two counties. This region roughly overlaps with the Appalachian mixed-mesophytic forests, which begin in southeast Ohio and southwest Pennsylvania and continue to north Georgia and Alabama. The mixed-mesophytic forest is found only in Central and Southern Appalachia and eastern/central China. It is one of the most biodiverse temperate forests in the world. Geologically, Appalachian Ohio corresponds closely to the terminal moraine of an ancient glacier that runs southwest to northeast through the state. Areas south and east of the moraine are characterized by rough, irregular hills and hollows, characteristic of the Allegheny Plateau and Cumberland Plateaus of the western Appalachian Plateau System. Unlike eastern Appalachia, this region does not have long fin-like ridges like those of the Ridge-and-Valley Appalachians subranges, but a network of rocky hollows and hills going in all directions. The region is considered part of "central Appalachia", a political, cultural, and bioregional classification that includes southeastern Ohio, Eastern Kentucky, and most of West Virginia. 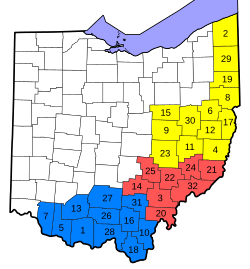 The Governor's Office of Appalachia subdivides the 32 counties of Appalachian Ohio into three smaller regions: East Central Ohio, South East Ohio, and Southern Ohio. The following lists include each county in the region and its county seat. Port Columbus International Airport, in Columbus, is the largest airport and serves most of the residents in southeast Ohio. Port Columbus offers primarily domestic flights. Cincinnati/Northern Kentucky International Airport to the southwest serves most of the residents of Cincinnati and its metropolitan area, and Cleveland Hopkins International Airport to the north is also a major hub airport. Map showing 2012 ARC economic designations for Appalachian Ohio. The Appalachian Regional Commission was formed in 1965 to aide economic development in the Appalachian region, which was lagging far behind the rest of the nation on most economic indicators. The Appalachian region currently defined by the Commission includes 420 counties in 13 states, including 32 counties in Ohio. The Commission gives each county one of five possible economic designations— distressed, at-risk, transitional, competitive, or attainment— with "distressed" counties being the most economically endangered and "attainment" counties being the most economically prosperous. These designations are based primarily on three indicators— three-year average unemployment rate, market income per capita, and poverty rate. In 2009, Appalachian Ohio had a three-year average unemployment rate of 8.4%, compared with 7.5% statewide and 6.6% nationwide. In 2008, Appalachian Ohio had a per capita market income of $22,294, compared with $29,344 statewide and $34,004 nationwide. In 2009, Appalachian Ohio had a poverty rate of 16%, compared to 13.6% statewide and 13.5% nationwide. Seven Ohio counties—Adams, Athens, Meigs, Morgan, Noble, Pike and Vinton—were designated "distressed", while nine—Ashtabula, Gallia, Guernsey, Harrison, Jackson, Lawrence, Monroe, Perry and Scioto—were designated "at-risk". The remaining half of Appalachian Ohio counties were designated "transitional", meaning they lagged behind the national average on one of the three key indicators. No counties in Ohio were given the "attainment" or "competitive" designations. Athens County had Appalachian Ohio's highest poverty rating, with 32.8% of its residents living below the poverty line. Clermont had Appalachian Ohio's highest per capita income ($30,515) and Holmes had the lowest unemployment rate (5.5%). Washington County has the highest high school graduation rate (84.5%), while Adams County has the lowest (68.6%). Although Holmes County has a significantly lower high school graduation rate than Adams County at 51.5%, its graduation rates are somewhat skewed compared to the rest of the region, due to the county's high population of Amish, whose children do not attend school past the eighth grade. Appalachian Ohio Facts for Kids. Kiddle Encyclopedia.